MediMiss Best Flea Treatment Bug Treatment cure eczema Cure for Eczema Eczema Babies Eczema Treatment Home Remedies how to Human Fleas pictures Sand Flea Bites Treatment of flea bites on human Treatment of Flea Bites on Human - What Home Remedies Available? Treatment of Flea Bites on Human - What Home Remedies Available? Fleas not only bite and live off your pets, they bite people too. The typical human reaction to a flea bite is the formation of a small, hard, red, slightly raised, itching spot with no swelling. Some bleeding can occur, particularly if the bitten area is scratched. A single puncture point caused by the flea is generally apparent in the center of each spot. Flea bites normally occur on the legs and ankles. Different people have different reaction to fleabites. 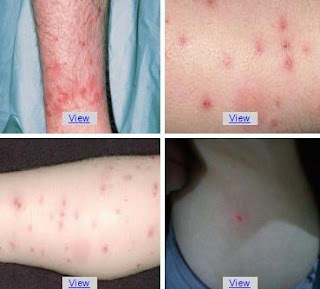 Some people are totally unattractive to fleas and are not affected by the presence of fleas while others may be "appealing" and sensitive to fleas resulting in severe allergic reaction to their bites. Well, how to treat flea bites on human? Before you run off to your family doctor to seek medical treatment, here are some home remedies for the treatment of flea bites on human. 2. Secondly, apply a cold pack over the bites to reduce swelling. 3. Do not scratch the inflamed area as this may lead to open wounds and secondary infections. 4. If the affected area is read and swollen, you may apply a mild steroid cream like 1% hydrocortisone cream. This should be easily available from any pharmacy without the need of a prescription. Hydrocortisone helps in reducing inflammation rapidly. Alternatively, if you have a bottle of calamine lotion at home, this may help too. 5. Very often, the itch caused by the fleabites can be very intense. An oral dose of anti-histamine like Dimetapp, Chlortrimeton is very effective in relieving itch. Once the itch stops, you will stop scratching as well and the healing will take place faster. Treatment of flea bites using these home remedies should improves within a few days, However, if the condition worsen whereby, they remained red and swollen with discharges, then a trip to your family doctor may be necessary. Your doctor may prescribe a course of antibiotics for you and a jab of steroid may be needed to stop the inflammation.